The Altus Company, founded by Shuichi Tanaka, produces handmade flutes in the town of Azumino in Japan. Altus is one of the most innovative companies when it comes to alloying and new ways of construction. 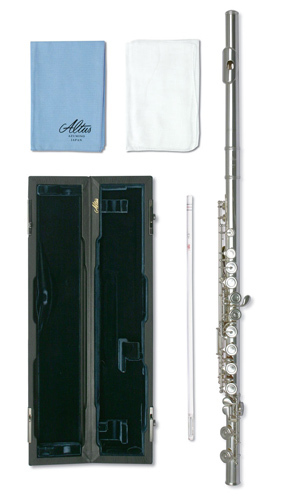 The flute is looked upon as a piece of art, and Altus is relying on the European tradition of flute craftsmanship (Lot and Boehm). The 807 Artist models have a .925 sterling silver lip plate and riser which gives a richness of tone above a standard silver plated lip plate and riser. The headjoints are hand finished in Japan and as such despite the fact it is just the lip plate and riser that is silver most players would find this flute more expressive and enjoyable to play above a machine made student design in full solid silver, ie It's not always the amount of silver that counts, but who is making it, how they are making it and to what design. Supplied with S cut headjoint for flexibility, ease of play and rich tone. handmade .925 sterling silver lip plate and riser. Silver plated head, body and footjoint.